Go the F away I say. On Friday I just had to get out. I needed some fresh air. So I donned the Baby Bjorn, popped Abi inside, grabbed an umbrella and went for a quick walk. Now, I have decided to do something about that! No more wet feet for me! Here is my Friday splurge! I haven't spent much money on myself lately, so I felt like I deserved them! Behold my new Hunter Wellies! I am super excited! 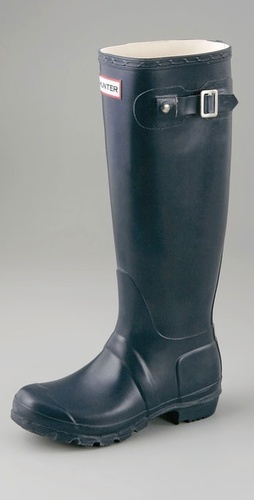 Yes, spending $125 on a pair of 'gumboots' is a little crazy... But hey! I have wanted a pair of these for as long as I can remember. Ever spent a silly amount of money on something you seriously don't need? Oh! And have you entered my GIVEAWAY??? Brilliant! I was considering getting some gumboots this week but I couldn't think where I'd buy them from! Our backyard flooded, the poor chickens were wading around up to their bellies! Nice purchase! I've had my eye on the bottle green Hunters for as long as I can remember. I have a Burberry pair that I bought a while ago... Have been wearing them non stop the last few days!! I love them! I've ben meaning to get a pair for the past couple of winters and always forget.